The photos above are of the vessels situated on the Walkway Over the Hudson, in Poughkeepsie, NY (as proposal shots), as well as from the 7/23/17 event at the People's Waterfront Park in Newburgh, NY held in conjunction with the Seachange Voyage. The health of both the Missouri and Hudson Rivers - their vast watersheds and the populations they support - are threatened by oil pipelines - one currently operational (The Dakota Access Pipeline), and one currently in proposal (The Pilgrim Pipelines) - that transport highly volatile and toxic fracked crude oil from the Bakken Shale Formation in North Dakota. As our country faces critical choices about the energy infrastructures we invest in and support, it is imperative to have public, open, informed, and creative dialogue about pressing dangers, available options, and viable pathways for actions to help realize greater social-environmental justice. I hold that these conversations can be deepened, enriched, and motivated in part by direct experiences in acts of ritual and participatory art. 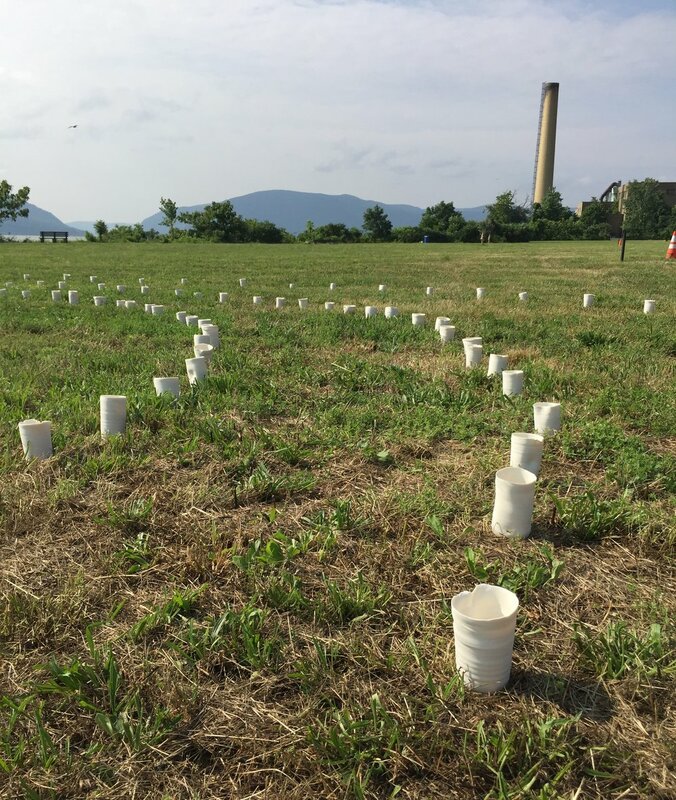 At 10:00 am, at the former site of Consolidated Iron - and then a Superfund site which has now been remediated to become the People's Waterfront Park in Newburgh, NY - Seachange Residency participants joined with their friends, family, and local citizens gathered at the installation, which consisted of 328 of my handmade porcelain vessels placed in four concentric circles. Pre-contact, the People's Waterfront Park was a significant site for the Waoranek Tribe (of the Lenape People), as a location where they offered a ferry service across the river using dugout canoes made from tulip trees. The Waoranek sold this enterprise to Dutch colonizers as they found themselves forced from their land. * The installation created the space to hold prayers starting with the Lakota Great Spirit Prayer and the Thanksgiving Address of the Haudenosaunee (also known as the Iroquois Confederacy or Six Nations), my own prayer-poem Plainsong Kico, and then prayer-songs led by Melissa Billington, transmitted to her from elders of the Northern and Western Ojibway Nation (as one example, please see this link), during a participatory water blending ceremony, in which participants mixed water from the Hudson River/ Muhheakantuc with water from the Missouri River/ Mni Sose reservoir at Lake Oahe, and the Cannonball River/ Inyanwakagapi Wakpa, which form, respectively, the eastern and northern boundaries of the Standing Rock Sioux Reservation of North and South Dakota, and provide the essential water supply for this community as well as others. The great River that Flows Both Ways flowed alongside us, and the ceremony concluded with individual participants using the vessels to carry all the blended waters to the shore of Muhheakantuc, to release the water there, energized by our individual prayers of gratitude for the great element of water, and for the protection of water and life. Jayohcee, a First Nations Mohawk warrior and performer and songwriter from the Akwesasne Mohawk community, who lived at the Prayer Camps at Standing Rock for six months, closed our ceremony with the Mni Wiconi ("Water is Life") chant from Standing Rock. The number of vessels (328) signifies the number of days that the Prayer Camps of Oceti Sakowin/ The Standing Rock Sioux Reservation were active (April 1, 2016 - February 22, 2017) despite the actions of highly aggressive militarized police. This ceremony honored Standing Rock as the place where the worldwide Mni Wiconi/ Water Protector Movement gained significant momentum and force. Indigenous people - grounded in thousands of years of spiritual practices which honor and protect the sacred - currently lead the fight against fossil fuel infrastructure projects and the exploitative "extraction" mentality. Participants were offered to take a vessel from this participatory event. See the video below as one event participant considers her choice of vessel. The remaining vessels from this event were wood-fired later in the summer and fall of 2017 and many of them will form part of a sculptural installation and interactive "monument" to the Water Protectors of Standing Rock and beyond. This installation will be exhibited at Art Centro in Poughkeepsie, NY in October 2018. Refer to Each, Day Water for further details. * Gratitude to Evan Pritchard for this information. Berenice Tompkins discusses the vessels, water, and gifting at Plainsong Kico, in Newburgh, NY, an event offered to the public in conjunction with the Seachange Voyage. July 23, 2017. Please refer to my artist statement Making Connection, Not Claim: On My Native Ancestry for further contextualization.